Yes, iPad Security Case fits iPad Air 2. But please note the camera of the iPad Air 2 have been moved slightly so it won’t line up with the iPad Security Case. 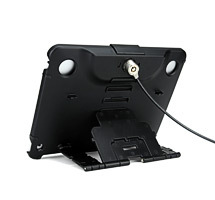 The camera may not be able to function properly with our iPad security case.